In response to Governor Brown’s signing of Assembly Bill 1776, which designates the endangered leatherback sea turtle as California’s official state reptile and designates October 15 as Leatherback Conservation Day, state and federal agencies have been encouraged to build cooperative relationships with the Western Pacific island nations, where Pacific leatherback sea turtlesreturn from California waters to nest. This fall, from October 14-17th, political leaders from Indonesia and the United States will meet with notable marine and leatherback scientific experts to discuss the status of the species, the population, international conservation efforts, current conservation efforts in both countries, and socio-economic research of conservation. The reasons for the leatherback population decline are primarily related to human activities such ascapture in fisheries, egg poaching, habitat loss, marine plastic pollution, and climate change. The U.S. National Marine Fisheries Service designated 41,914 square miles off the West Coast as critical habitat for leatherbacks in 2012 in response to a petition by Oceana to protect critical feeding grounds. On beaches in Bird’s Head peninsula, Indonesia, locals, with the assistance of the World Wildlife Fund and UNIPA (The State University of Papua), have spearheaded local training, monitoring, patrolling, and are managing efforts to protect nesting sites, but funding for local efforts are limited. It’s time for California and Indonesia to pull their expertise and resources to save the leatherback. 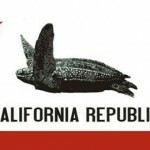 Like the leatherbacks, representatives from Indonesia will migrate across the Pacific Ocean to Monterey, CA. They will meet with officials from the State and National governments to discuss an agreement to protect the endangered species from threats in both locations. The hope is that an agreement will provide support for increased protection of the nesting beaches and the entire Pacific leatherback population. This entry was posted in Uncategorized on July 19, 2013 by Malcolm.